What are the Serial Set Maps? The Serial Set Maps collection is a collection of more than 70,000 maps printed as part of the Congressional Serial Set. With the High-Resolution Maps Module, more than 50 percent of these are scanned at high resolution enabling users to see and download the smallest details on the map. The rest of the maps are mostly outline maps and would not benefit from being scanned at high resolution. Several Executive Branch agencies are the most prolific publishers of the maps including the Army Corps of Engineers and the U.S. Geological Survey. 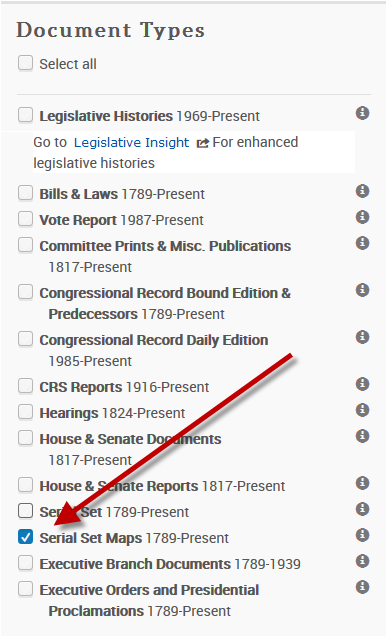 Links listed here are bookmarks into specific parts of the Advanced Search menu in Congressional. Users with the U.S. Serial Set Digital Collection who do not have access to the High-Resolution Map Module may also see the document type on the Advanced Search tab as they have the indexing for the maps. To check to see if your institution subscribes to the module, check the link in this box, or search for this map in the basic search form, 826 S.exdoc.22, map 24 to see if the link to the thumbnail image shows up near the bottom of the page. If you see the link, you have the module. If you don't see the thumbnail, the maps are in the volume that is linked to from the record, however they do not have all of the functionality shown on the Searching the Maps page of this guide. Users can search for Serial Set Maps through the Basic and the Advanced Search pages, and the Search by Number - Bibligraphic Citations - Serial Set Volume lookup. The Advanced Search form provides both the ability to search only the maps, and the ability to search specific parts of the metadata (indexing) for the maps. From the Search by Number - Bibliographic Citations page, use the Serial Set volume search to retrieve the volume with any accompanying maps.